The CA-9 Path-Averaging Laser Anemometer, the first product marketed by Campbell Scientific. Campbell Scientific was organized in 1974 by two brothers, Eric and Evan Campbell, in Logan, Utah. Other Campbell family members assisted in the business venture by providing the initial capital, direction, new product definition, and conceptual development. 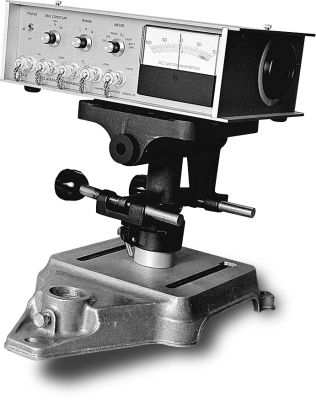 The first product Campbell Scientific marketed was the CA-9 Path-Averaging Laser Anemometer in 1974. The laser anemometer was followed in 1975 with the company’s first data acquisition system, the CR5 Measurement & Control System. Since the introduction of the CR5 in 1975, Campbell Scientific has manufactured more than 350,000 data loggers. Building on decades of experience, Campbell Scientific has developed increasingly powerful data loggers that have achieved worldwide use in environmental, research, and industrial markets for diverse applications. Over the years, Campbell Scientific has also established itself as a reputable manufacturer of numerous related product lines for the measurement field, including a wide variety of sensors, as well as devices for the collection, storage, communication, and retrieval of data. Through innovative product development, the manufacture of high-quality products, and excellent customer support, Campbell Scientific endeavors to meet the instrumentation needs of their customers. To better serve their customers worldwide, in 1980, Campbell Scientific began to open affiliate offices across the globe. Today, affiliate offices operate in Australia, Brazil, Canada, China, Costa Rica, France, Germany, South Africa, Southeast Asia, Spain, the United Kingdom, and the United States. From its modest yet high-tech start with a laser anemometer in 1974 in Logan, Utah, Campbell Scientific has become a global company, trusted worldwide for producing accurate and dependable measurement and control instruments. See some of our most noteworthy accomplishments and newsworthy moments in the company timeline below. Campbell Scientific introduces the SoilVUE™10 TDR Soil Moisture Profile Sensor with proprietary TrueWave™TDR technology. Campbell Scientific celebrates their 25-year anniversary of working with their Campbell Scientific do Brasil colleagues. Campbell Scientific receives an award from the Utah Manufacturers Association for exemplifying outstanding safety in the workplace during the past year. Campbell Scientific is chosen to receive a 2018 Charles A. Caine Award for Workplace Safety from WCF Insurance. Campbell Scientific is awarded the "Outstanding Contribution to Technology & Innovation Award" from the Cache Chamber of Commerce. The CR1000X Measurement and Control Datalogger is introduced as the eventual replacement for the widely used CR1000. Campbell Scientific begins a recycling program for electronic devices in conjunction with its commitment to environmental sustainability. Campbell Scientific begins posting updates to its Campbell Scientific, Inc. LinkedIn profile page and to its Campbell Scientific, Inc. Facebook page. Coastal Environmental Systems becomes a wholly owned subsidiary of Campbell Scientific, Inc.
Campbell Scientific begins tweeting from its @CampbellSci Twitter profile page. Campbell Scientific has shipped more than 300,000 data loggers since the company's first data logger was sold in 1975. Campbell Scientific introduces the CR1000, which becomes the company’s most widely used data logger. Campbell Scientific sells its 100,000th data logger since their first data logger, the CR5, was introduced in 1975. Campbell Scientific introduces the CR200-series dataloggers with a PakBus operating system that puts data packets onto the network; many of these data loggers contain on-board spread-spectrum radios. Campbell Scientific introduces LoggerNet 2.0, which becomes their standard data logger support software package, working well in applications requiring telecommunications or scheduled data retrieval in large data logger networks. The Russian module of the International Space Station begins using a Campbell Scientific data logger and two multiplexers as part of a plant-growing experiment. Campbell Scientific introduces the CR5000 Measurement and Control Datalogger, their first compact data logger to feature CRBasic programming language and table data storage as standard features. Campbell Scientific ships its fastest data logger, the CR9000 Measurement and Control System, which features sampling rates up to 100 KHz and parallel processing capability to better support noise and vibration measurement and turbulence studies. Campbell Scientific introduces the CR10X, their first data logger to use surface-mount technology. Campbell Scientific introduces a variety of products to enable data loggers to record volumetric water content using time-domain reflectometry (TDR). Campbell Scientific introduces the CR10 Measurement and Control System, which quickly becomes the standard data logger for most operational weather station applications. Campbell Scientific introduces the CR7 Measurement and Control System, their first modular data logger that enables users to select the number and type of I/O modules to match their particular applications. Campbell Scientific introduces its first data acquisition system, the CR5 Digital Recorder.